With the summer transfer window coming to an end, club managers are making sure everything is put in place before the new season kick-starts. Chelsea manager Maurizio Sarri has added one player to his team as the move for Rob Green has been completed. According to reports on Chelseafc.com, goalkeeper Rob Green has officially joined the Blues on a free transfer as he was a free agent following his exit from Huddersfield Town at the end of last season. Rob Green didn’t have a commendable experience at Huddersfield as he didn’t make a first-team appearance for the club throughout his 12-month stay and he finally left after his contract expired in June last year making him a free agent ever since. Meanwhile, it was speculated recently that the 38-year old goalkeeper could possibly retire from his football career but that wouldn’t be happen as Chelsea made a shocking move earlier this week. Chelsea have been keen on having an experienced goalkeeper to be a backup plan and it seems they’ve succeeded as they announced on Thursday morning that Rob Green has signed an agreement to join the Blues. 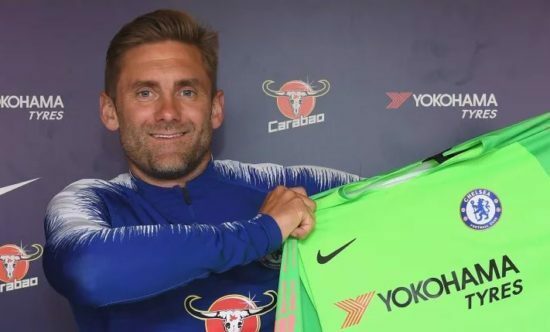 Rob Green made it known in the official website of Chelsea that the whole process came in a short notice and he is delighted about his choice and can’t wait to get started for the club. Although, Green would be Chelsea’s third choice with the likes of Thibaut Courtois and Willy Caballero on the team but he is considered as an experience option when the need arises.